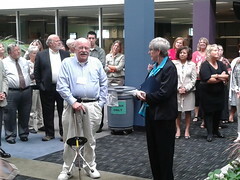 Congratulations to State Librarian Nancy Walton, who retires on August 1st. Library folks gathered at the Minnesota Department of Education on July 31st to reminisce, thank Nancy for her great leadership, and wish her well in her next life chapter. Bill Asp (above) was the State Librarian who hired Nancy as the Director for what is now called the Minnesota Braille and Talking Book Library in Faribault (part of the State Library). Bill, who is now retired, was East Central Regional Library’s Director from 1967 to 1970. Nancy has been seen at ECRL events many times, including the dedication of the bronze sculpture at Chisago Lakes last week. She is pictured below with MN Representative Bob Barrett, Sculptor Ian Dudley, and ECRL Director Barbara Misselt. Congratulations, Nancy! You’re a good library friend!! !